A suicide bomber has carried out an attack in central Istanbul, killing at least 10 foreigners, mostly German tourists, and injuring 15 more, according to officials. Police said the suspect was of Saudi Arabian origin. At least eight Germans were killed and nine seriously injured in the Istanbul attack, German Foreign Minister Frank-Walter Steinmeier said. “It has been years since we were hit by terror as hard as we have been hit now in Istanbul," Reuters cited Steinmeier as saying. One of the people injured is Norwegian and another is Peruvian, according to Dogan news agency. Norway’s Foreign Ministry later confirmed that one Norwegian citizen was injured in the blast and was receiving treatment at a local hospital. "It's not a life-threatening injury," Norwegian Foreign Ministry spokeswoman Guri Solberg said. Peru's Foreign Ministry also confirmed that one Peruvian man was killed and a Peruvian woman was wounded in the suicide bombing. There was a group of German tourists on the square at the time of the blasts, an official from a tour company confirmed to Reuters on condition of anonymity. The explosion took place on Sultanahmet Square, close to the Sultanahmet tram stop and Dikilitas, the Obelisk of Theodosius, in the heart of Istanbul’s historic tourist district. Turkish President Recep Tayyip Erdogan said a Syrian suicide bomber was believed to be responsible for the deadly attack. "I condemn the terror incident in Istanbul, assessed to be an attack by a suicide bomber with Syrian origin. Unfortunately we have 10 dead, including foreigners and Turkish nationals... There are also 15 wounded," Erdogan said. Istanbul authorities are investigating the incident and the type of the explosives used in the blast, the city governor’s office said. 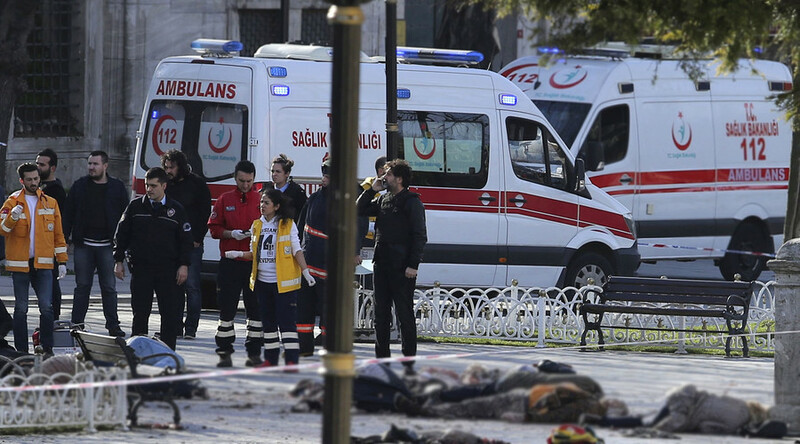 The suicide bomber was identified as a Syrian born in 1988, Deputy Prime Minister Numan Kurtulmuş told a press conference, adding that most of the victims of the blast were foreigners. Dogan news agency later reported that the suspect had been identified as Saudi-born Nabil Fadlı. His birth year was confirmed as 1988, the agency said, citing police. Prime Minister Ahmet Davutoğlu also said the suspect may be a member of the terror group Islamic State (formerly ISIS/ISIL). According to Turkish officials, Fadlı recently entered Turkey from Syria. Erdem Koroglu, who was working at a nearby office at the time of the explosion, told NTV he saw several people lying on the ground following the blast. One woman who works at a nearby antiques store told Reuters that the explosion was very loud. "We shook a lot. We ran out and saw body parts," she said. A German tourist named Caroline told AFP: "I started running away with my daughter. We went into a nearby building and stayed there for half an hour. It was really scary." A police officer at the scene said: "We're taking precautions against a second explosion." Shortly after the blast, Turkish authorities slapped a media ban on covering it, Anadolu news agency said. Following the Istanbul attack, Turkish police carried out raids in five major cities, where they arrested 59 people suspected of links with Islamic State, Daily Sabah reported. The detained have been accused of hosting new recruits waiting to join IS in Syria, collecting money and getting prepared to carry out attacks inside Turkey. In the Turkish capital, Ankara, 16 people, including 15 Syrian citizens, were arrested. They are now being prepared for deportation to Syria, TASS reported. Sultanahmet Square, once a social center of the former Constantinople, is a popular tourist destination. A 30-meter-tall Obelisk of Theodosius made of red granite is located in the center of the square, as well as the famous German Fountain (The Kaiser Wilhelm Fountain) which was constructed by the German government back in 1900. Two key tourists attractions near the square are the Hagia Sophia and the Blue Mosque. The Hagia Sophia museum is a former 6th century Byzantine church and 15th century mosque, and the Sultan Ahmet (or Blue) Mosque, built in the 17th century. Both attract thousands of tourists and pilgrims every day. The UK Foreign and Commonwealth Office (FCO) has also issued a travel warning for British citizens in Turkey. Moscow has expressed “deep condolences to the families of those who died” in the terror attacks in Baghdad and Istanbul on Monday and Tuesday, the Russian Foreign Ministry said. Those “cynical crimes… have once again demonstrated the inhumanity and brutality of international terrorism,” the ministry said, calling on world powers to consolidate anti-terror efforts.